The Vanilla Spice Hanukkah candle by Adco Marketing is a great promotional gift to give during the holidays that will bring hours of frangrance and light into any home or office. This custom soy candle is made with clean burning soy wax, lead-free cotton wicks and scented with the finest quality fragrance oils. 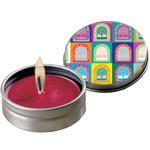 Made in the USA this candle has 83 hours of burn time and the gift box can be customized with your logo or design. So if you are still trying to think of that one last gift to give...this just might to one for you from our selection of promotional holiday candles. Gold and Blue Stripe as shown. Production Times Available: 3 weeks standard. Made upon order. Dimensions: 4"W x 4"H x 4"D / 11 oz. Other scents and color schemes available - Please Inquire, Can mix almost any PMS color for the wax, Made in USA, 11 oz. with approx 83 hours burn time, Soy Wax with lead free wick, Gift boxed.